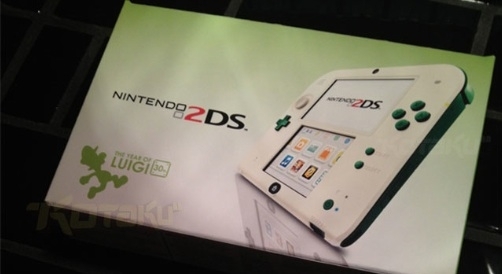 Already out in Japan, the green and white handheld could make its way to the United States. A green-and-white handheld may not sound like the ultimate purchase, but if you're a fan of Mario's brother Luigi, it's all you really need. A special edition of the recently released Nintendo 2DS dedicated to the mustached hero is now available in Japan, and Nintendo of Europe also announced that it will arrive in that territory on November 1st. Now it's just a matter of time before it comes to the U.S., especially with the Year of Luigi promotion going on. Nintendo is no stranger to announcing exclusive systems for Japan and then quietly releasing them in other markets. The company has a Legend of Zelda-style 3DS XL coming to Japan, and no official word on when the system will come to the United States. However, a recently leaked Gamestop Black Friday ad indicates it's on the way, along with a Luigi's Mansion bundle. It's probably just a matter of time before the Nintendo 2DS model gets some love. Even if it is white and green.